Sometimes I get the urge to write a short story. Usually the feeling passes, but this one stuck with me and kept nagging until I let it out. More story notes at the bottom. A shaggy dog barred my path through the door. He was my sister’s dog, a long-suffering poodle lounging in the Louisiana heat. “I can’t believe you make him put up with this humidity,” I said as I stepped over him and into the tiny office. My sister grunted but didn’t look up from her pile of papers. “He doesn’t mind. You’re projecting.” It was true; I didn’t like the heat any more than George seemed to. Boulder was much more my style, but Lalita preferred to live in places that felt like saunas to me. Mumbai, Austin, and now Baton Rouge. It was like she picked the stickiest, dingiest places just to keep me away. I know, projecting again. At least I visited her wherever her research funding happened to take her; she hadn’t been to see me in Boulder once in the decade I’d lived there. I barely suppressed a smile. “Then let’s. Are you ready for lunch?” I didn’t mention how anxious I was to get away from the buzz of insects and into the air-conditioned restaurant. The restaurant was a blessed relief for me, but Lalita looked uncomfortable as soon as we sat down. “We could have eaten on campus,” she said and scowled at the menu. “NOT time machines!” she yelled. I reeled back and almost knocked over my water. “All right, not time machines. Forget I said it. Show me what you were going to show me.” I leaned in again and focused on the tablet. The graphic on the tablet was a sophisticated version of the ones I’d seen on Lalita’s chalkboards many times before. Lines split, joined, and crossed each other in intricate patterns. It looked like something out of a how-to book of sailor’s knots than anything I knew of physics, but I knew better than to make the analogy. “It’s a simulation of the kind of particle interactions we’ve been working with in the lab.” She started poking at the visualization, and dots raced from one side to the other, following the intertwined paths. Now it looked more like a hospital chart, except those usually didn’t backtrack and spin around each other. “No it isn’t. If it was, those particles shouldn’t be going the wrong way.” I pointed to places where some of the bright dots turned around and moved backwards relative to others. Luckily, our food was served at that moment. We sat in stony silence, and I noticed a speck of something move around in my water glass. A fly, apparently doing its impression of a crazed particle’s world-line. I asked for another glass of water. She held her finger over one of the racing dots, and suddenly I saw what she meant. It traveled up and down along its path, but then turned around in a shower of sparks to zip back along a trail that I had assumed was another particle. That flew off�in the wrong direction, the negative-time direction�until it joined another group of swirling particles and made its way forward again. Finally it got back to its “original” time and met up with the sparks it had given up. Her eyebrows shot up. “Oh really? You want to point a beam and send a camera to spy on someone.” She mimed the process with her hands, and I had to laugh. I waited for her to go on, but she must have been waiting for me to catch up. I stared at my water glass and noticed another fly had fallen in it, before I’d even taken a sip. I knew how it felt. That night we managed to get through dinner without talking about spy beams or time machines. Lalita was much more comfortable in her own kitchen than the hotel restaurant, though I probably cooked there more than she did. She asked me about my work, and I told her as much as I could, minus the classified details. We talked about the lack of funding for pure physics research, and I gently offered for the thousandth time to get her an applied research position at my company. She gently ignored the offer for the thousandth time. It was over the second bottle of wine that she dropped the bomb. I’ll always remember the scene exactly: the two of us sitting around her tiny kitchen table, her leaning down to feed George the remains of our meal with one hand while cradling a wine glass with the other. Me stacking dishes off to one side because I was avoiding any work in the humid evening. A moth hovering near the lamp above the table, bouncing annoyingly between the lampshade and the bulb cover without settling down. “I worry about time travel.” She said it matter-of-factly, like she was talking about our mother’s new boyfriend or the rent. “Do you, now?” I wasn’t sure how seriously to take her. “Troubling? In what way?” I’m not sure why, but I’ve always felt a special dread when my sister’s work troubles her. 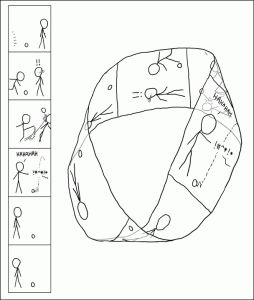 The problems physicists worry about tend to be either trivial or world-ending, and it’s hard to tell which are which. “Remember those pinched histories? They can be… bad.” Her voice trailed off. “Just as bad as I showed you. When we tried to affect quantum state over distances, it reached back into the past to make that possible and pinched all the histories involved. I wanted to see if we could use that effect to change quantum states in the past.” She frowned. She drained her glass of wine and poured another. I noticed her hands shake a little. She gulped another glass and grabbed a tablet. “Do you ever wonder about aliens?” She poked violently at the tablet’s screen. “Aliens. Specifically, where are they?” She showed me the tablet’s screen, now covered with a map of the sky, filled with stars and their myriad names. “A third of these stars have planets like Earth. Some of them have life like ours, and some of that life might evolve into beings capable of space travel or interstellar communication.” She paused, staring at the map. I groaned. “You’ve stopped making sense. I should go.” I stood up, a little uncertainly. “�having this completely ludicrous conversation.” I said. “Good night.” I patted George and left before the conversation could get worse. The next day I awoke with a start, sitting bolt upright in the hotel bed, a little disoriented about where I was. Something in my dream had been very important, but it drifted away before I could remember. Over breakfast in the hotel restaurant, it came back to me all at once. I watched a fly wind its way around the lazily-spinning ceiling fan, and it all became clear. I dashed out of the hotel and nearly ran to the university before realizing that it was miles away and I’d die from heat exhaustion after a few blocks. The taxi couldn’t get me there fast enough. The whole way I worried that my epiphany was a hangover-induced delusion, something my sister would tear to shreds with a single comment. Still, I had to tell her. It might be right. George was draped across the doorway to her office again, and Lalita looked at me sleepily over her breakfast pastry. “Mff?” she said, and her eyes opened wide as I leaped over the shaggy dog. Yeah, sorry about that. The puns are bad and physics is awful, but at least the story and characterization are terrible. The “time flies” concept came first. Wouldn’t it be great to be a fly on the wall at the signing of the Declaration of Independence? We always say that, but who’s actually doing something about it? Surely we could come up with a way to send a tiny fly-cam back in time and bring it back, all without interrupting the “original” history. Who notices another fly? Oh yes, the puns. Some of my favorite Asimov short stories are either shaggy-dog stories (like Shah Guido G.) or discussions between two people about some kind of world-changing idea (like Darwinian Pool Room). Poor George is a nod to the former, and the two sisters provide the latter while also satisfying the Bechdel Test. This week’s experiment was a great success. That isn’t to say that it went off without a hitch; the hitches made for more valuable learning than the experiment itself. We set out to make a simple electric circuit, but what we ended up doing was troubleshooting and learning about unstated constraints. The experiment was a series of steps from The Science Book Of Electricity (Gulliver Books, 1991). The book has a few simple experiments like this one, described in general terms with lots of photos. There’s no theory and not much in the way of details, but the descriptions were enticing enough to catch my eight-year-old geeklet’s interest without any pushing from Dad. The first step was to make a simple circuit using a light-bulb holder, bulb, two lengths of wire, and a battery. Trivial stuff, we lacked some of the necessary materials. The hardware store had everything we needed, but our parts were lost among all the variations of bulbs and wiring available. (Lesson: a simple parts list contains a lot of assumptions.) We eventually picked out a basic bulb holder, a set of 4W night light bulbs, and three feet of coated copper wire. Now came the fun part: troubleshooting! How did our setup differ from the book’s description? The geeklet noticed a caveat in the book: “The battery must be the same voltage as the bulb.” What did that mean, though? The battery’s voltage was printed helpfully on the side: 1.5V. The bulbs, though, were listed as 4W. (Lesson: units are important.) I talked a little bit about the difference between current and voltage, and we looked more closely at the package of bulbs. No hint of voltage listed anywhere. Hmm. A quick check with Mama (who recently had to buy bulbs for one of her projects) yielded the clue we needed: a bulb’s voltage is often listed on its base. We scrounged through the tool box to see if there were any other bulbs. We found a krypton bulb for a flashlight, which was listed (now that we knew what to look for) as 3.6V. Closer, but how to make up the difference between a 1.5V battery and a 3.6V light? This gave me a chance to talk about serial vs. parallel circuits, and how batteries in series will add their voltage together. 3 batteries at 1.5V made 4.5V, which should be close enough to make the bulb light up. The next step was to wire in a pair of thumbtacks, spaced slightly apart on a bit of cardboard. These allowed us to bridge the gap with pins, coins, cloth, buttons, and other things that may or may not carry electric current. A tester! (Lesson: even our improvised monster circuit met the requirements of the experiment.) Once that principle was shown, we used one of the handy current-carriers (a paperclip) to fashion a contact switch. The geeklet showed off the completed circuit and switch to Mama, and we talked about applications like telegraphs and signal lights. Writing this up, I just now realize that we re-invented the flashlight using (essentially) flashlight parts. Oh well, the process was the important thing. The Mpemba Effect: A Good Case For Citizen Science? Mpemba made his accidental discovery in Tanzania in 1963, when he was only 13 years old and in secondary school. In spite of widespread disdain from his classmates, he surreptitiously continued experiments on the phenomenon until he had the good fortune in high school to interact with Professor Denis Osborne of the University College Dar es Salaam. Osborne was intrigued, carried out his own experiments, and in 1969 the two published a paper in the journal Physics Education. So what did Osborne�s research show? He placed a 100 cm� beaker filled with 70 cm� of water on a sheet of insulating foam in a freezer, and timed how long it took for the water to freeze. For temperatures up to 20 �C, the time was roughly proportional to the temperature above freezing, up to a maximum of 100 minutes at 20 �C. For higher temperatures, however, the time dropped dramatically, down to 40 minutes for 80 �C water! Be sure to read the complete article for the whole story, including many attempts to characterize the Mpemba effect over the years. 50 years later there still isn’t a strong consensus about what causes the effect, and in many cases it’s supposed to be difficult to reproduce. Why the citizen-science approach? I suspect that rather than trying to control all the known factors to produce the desired result, we instead want to track as many factors as possible to characterize the space of results. This particular effect will probably require a “vast multidimensional array of experiments“* to characterize properly, so enlisting a large number of citizen scientists makes a lot of sense. Besides, each and every one of the test participants can have fun guessing at the real causes involved. Who doesn’t love a little armchair theorizing? * Yes, I’m ‘citing’ Wikipedia. The original article cited there is inaccessible, and the rest of the Wikipedia summary is informative stuff. This may seem like an odd diversion, but John asked about it just this morning so I thought I’d share with the rest of the class. One of the things that was clear from experiments was that electron have spin. A first naive picture of an electron – this is not an accurate picture but it’s a start – is as a tiny ball with electric charge – which is what flows when a current flows in a wire. If you spin a ball of electric charge, the electric charge goes around in a circle. You effectively have a tiny current going around, and when you have a current like that you have a magnetic field – the electron becomes a tiny magnet. The presence of that magnetic effect is pictured as the electric charge spinning around. If the electron was still, it wouldn’t have this magnetic effect. 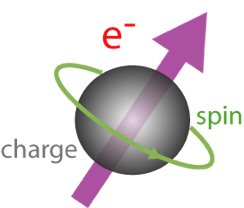 Among the many counterintuitive properties of the electron is the fact that it has spin one-half. This is the mathematical way of saying that if you rotate an electron through 360 degrees, it doesn’t look like it did before you started! There is no parallel for this in our everyday world – we are accustomed to being able to turn objects through 360 degrees and get them back to where they started. Imagine a reel-to-reel film projector. Running a short length of film through end-to-end works like you think it would. Tape one end of the film to the other; now you have a continuous loop of film that repeats itself. This would correspond to a spin of 1, because it looks the same after one loop. Now tape one end of the film to the other backwards, to make a M�bius strip. The film still loops, but now it does one loop with the frames reversed left-to-right. It doesn’t repeat itself exactly until the film has looped through twice, corresponding to a spin of 1/2. Looking at my to-do list today, I noticed for the millionth time how two key attributes of a task seem to be either redundant or in conflict: its due date and its priority. It always seemed to me that you should only need to assign one or the other. If you have a deadline, then what does the priority affect? 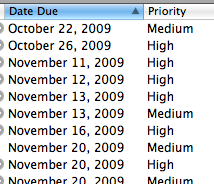 If the item is high enough priority, isn’t the due date ASAP? Today, though, I had a flash of insight. The due date defines how much I have to work on the item in order to get it done in time, almost like the velocity of the task. The priority, however, defines how resistant the job is to being derailed by other tasks, more like the inertia or mass of the task. Put that way, the two values aren’t redundant at all. In fact, you can put them together to determine the overall momentum of a project, based on the combination of the deadline-driven velocity and the priority-based mass. It might even be possible to come up with a formula for determining the outcome of a collision between two tasks, but I’ll leave that as an exercise for the project manager.